PSY-Practice City of London, Cannon Street and St Paul's, is a group of highly skilled, experienced psychotherapists. We offer prompt consultation for those interested in the therapeutic benefits of a “talking cure” in premises accessible to St Paul's, Cannon Street, Bank, and Mansion House in the City of London. We have substantial experience working in counsellor / psychotherapist practices and within counselling and psychotherapy services in the NHS, universities, charities and private practice. The therapy we offer at PSY-Practice City of London is non-judgmental and confidential. Some of the issues we work with include stress, anxiety, depression, relationship and sexual issues, addiction issues, anger and bereavement. 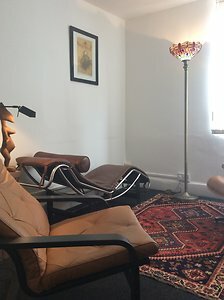 Our counselling and psychotherapy work is informed and thus enriched by the theoretical and clinical rigour of also working within the Lacanian tradition of psychoanalysis. To contact us individually please click here: [email protected], [email protected], [email protected]. Or message us via our email contact form. People come for therapy, be it counselling, psychotherapy or psychoanalysis, for the whole gamut of worries and symptoms, or for problems dealing with the rites of passage in life. While talking to friends, family or loved ones can be part of building relationships, talking about personal issues to a trained therapist - who listens attentively and without judgement - gives us an occasion to begin to identify the causes and reasons for what ails us. At some stage in our lives we may all encounter moments of stress, or worry, that impact our emotional health. However, on our own, it can prove difficult to move on or to change our relationship to life, especially when there is a sense of impasse, generalised depression or ongoing feelings of anxiety. Realising that certain problems, patterns of behaviour or types of relationship repeat in our lives - reasons for which we may have scant understanding - may lead us to contact a counsellor, psychotherapist or psychoanalyst. It is a realisation that something does not work in our lives and that some change is vital. For some of us, the source of suffering may reflect a purely personal or relationship difficulty. For others it may also relate to a wider unease over our place and reference points in a world changing ever faster culturally and politically. But how to effect personal change still eludes us. The space of a session is one in which it is possible for a therapist or analyst to listen very carefully to what is being said, to elicit and begin to hear something of the many threads of our lives, traces of speech and experiences of suffering that have affected each singular person, in mind and body. As such, our experience and orientation teaches us that symptoms will not go away until we have heard what they want to say and grasped something about their function and cause in a person's life. As such, the treatment of counselling, psychotherapy or psychoanalysis at PSY-Practice City - offered in confidence and at one's own pace - begins in a very small way, with an invitation for each person to start a process of speaking about what is difficult in life. It offers an occasion to articulate things that it may not have felt possible to say to anyone else before. It is by engaging with the impasses that our symptoms present - gradually elaborating with the words most familiar to us - that a path to negotiate our singular difficulties can open up. It becomes possible from this process to extract the dictums and axioms by which we live our lives, often without conscious awareness. There arises something of how the fabric of each singular identity has been constructed, making it possible to explore what underlies the more self-evident truths of our lives. And then to effect change - if we so wish. After an initial consultation, a number of preliminary sessions may be offered to give you time to gauge for yourself whether you wish to continue to work with a particular counsellor, psychoherapist or psychoanalyst at PSY-Practice. Your therapist will discuss with you an appropriate fee, together with the frequency of sessions envisaged. The duration of a treatment depends entirely on individual preference and how far each person wishes to go with the pathways that open up. For an initial consultation, please send a message via our email contact form specifying a therapist if you have a preference. Or contact us at our individual psy-practice email addresses. If you prefer, please do leave a message on our contact phone number 07812 472 286.
they will be enormous once one becomes aware of them." "[In analysis], we start from the symptom causing suffering. by way of its meaning, its history, its logic. It can then be written otherwise, [...]"
The Time of Urgency. The Act. Presentation by Susana Huler. Urgent Cases and the CPCT. Presentation by Victoria Woollard. Saturday 16th February 2-5pm - Conway Hall - 25 Red Lion Square, WC1R 4RL. Reading Seminar. Reading the Real Unconscious. Study Day on Formation of the Analyst. Presentations from special guest Laurent DuPont, former Analyst of the École de la Cause Freudienne and the WAP. Saturday 13th December 2018 2-5pm - Conway Hall - 25 Red Lion Square, WC1R 4RL. Psychoanalysis & Institutions. Presentation by Vincent Dachy. Saturday 24th November 11-5pm - 43 Gordon Square, Rm G04. Study day with Bruno de Halleux. Nine Lacanian Lessons Seminar: “Identification, Desire and Discourse”. "In a State of Transference: Wild, Political, Psychoanalytical"
Teacher in the Departient of Psychoanalysis at Paris VIII University and former English Literature professor at Rennes University Sophie Marret -Maleval lectures on the concept of transference. Part of a series of events working towards NLS Congress on transference today. Centrally based for Bank, Cannon Street, Mansion House and St Paul's in Queen Victoria Street, EC4N. We are situated next to Mansion House (District Line) tube, three minutes by foot both from Bank (Central, Northern, DLR and Waterloo & City Lines) and from Cannon Street (District Line and Overground Rail). Swift access from the Docklands and Canary Wharf using DLR. And we are easily accessible from Cannon Street, London Bridge, Blackfriars, Bankside and Waterloo Railway stations, plus most areas in the City of London, East London, Central, South and South-East London.